Great deals on self storage and moving containers delivered to Freehold, NJ or surrounding area. MI-BOX Mobile Storage & Moving services Freehold, NJ and the surrounding communities. MI-BOX mobile storage containers come in 3 convenient sizes. 8 ft. 16 ft. and 20 ft units. MI-BOX storage units are all brand new. MI-BOX storage containers are all coated in hot dipped galvanizing to prevent rust. Rust can damage your driveways surface. MI-BOX mobile storage units all have composite wall panels that will never hold moisture or rot. MI-BOX units have form fitting roofs that don't allow U V rays to penetrate and fade stored items. Other competing mobile storage containers have a translucent roof that let's UV ray in that can fade your furniture. MI-BOX Mobile Storage & Moving uses our patented technology to deliver each mobile storage unit Levelly. Our containers are locked in place with our Levelift System so contents remain level throughout the loading and unloading process. Each container is not dragged up onto tow truck like some competitors. Level deliveries protect your valuable items from shifting which can cause damage. Let's face it, MI-BOX Mobile Storage & Moving has the most durable, longest lasting mobile storage units available. Our superior Levelift System can place containers in more places with greater ease than any other competitor. MI-BOX of Central New Jersey is locally owned and operated so you're guaranteed to get great service and great prices every time. Call MI-BOX Mobile Storage & Moving of Central New Jersey. Then experience the difference of a new level of mobile storage services in Freehold, or anywhere in Central New Jersey. There are many moving companies servicing Freehold, NJ and the surrounding areas. Most are very reputable and provide good services at reasonable prices. But, they are limited in the services they provide. Many moving companies have the same things to offer their customers which is full service moving. It comes with a cost. Since they provide the trucks and labor they need to charge for their services. Just to be clear, there is nothing wrong with it. But, it all comes with a price. If you looking to save money and have multiple options not offered by most moving companies, then give MI-BOX of Central New Jersey a call. We rent mobile storage and moving containers. They come in 8 ft. 16 ft. and 20 ft. lengths. All moving vaults are 7 ft. 2 inches wide and can be combined to handle any of your moving needs. 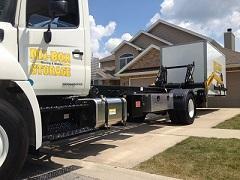 MI-BOX moving units can be placed in your driveway or at your place of business. They are secure and weather proof. They can be left at your site where you have the time to load them. Take your time and load on your schedule. You don't need to pay professional moving companies to do the easy work. Once each moving vault is loaded, we can move it to your new location or store in at our secure storage center for you. You have choices. We can move you across town. If your new home isn't ready, we can storage each unit as well. Whatever your moving needs are MI-BOX of Central New Jersey is here to help. Give us a Call Today and let one of our locally owned and operated MI-BOX owners help you. We provide cost effective and convenient moving options that will save you time and money. MI-BOX of Central New Jersey takes Moving & Storage to a whole new Level. MI-BOX Mobile Storage & Moving posts regular updates to our social media pages on Google+, Facebook and Youtube. Stay up to date with our latest moving and mobile storage specials in Freehold, NJ by visiting one of our sites today. Self Storage in Freehold, NJ just got much easier. MI-BOX Self Storage services Freehold, NJ and the surrounding areas with mobile self storage. We deliver portable self storage units right to you. With traditional self storage or mini storage, you need to load everything into your car or rented truck, then bring everything to the self storage unit, then unload it into the mini storage. Once you're done, you have to do everything all over again. Not anymore, with MI-BOX you only load once and unload once. We do all the driving. MI-BOX self storage containers come in 8 ft. 16 ft. and 20 ft. sizes so you only need to rent the space you need. You can mix and match the units for larger jobs so you'll save money by only renting the mini storage space you need. We service Freehold, NJ and the surrounding areas. MI-BOX mobile self storage units are convenient for all types of self storage needs and they save you time. MI-BOX of Freehold, NJ is independently owned and operated by local people. You're guaranteed to get the service you deserve. You're mobile self storage units are guaranteed to be delivered on time. We can gently place each unit at your home or place of business in the most convenient place to make loading simple and easy. 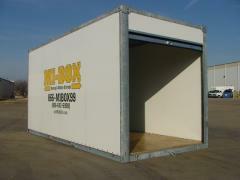 MI-BOX self storage units are the most durable, longest lasting mobile self storage containers on the market. We encourage you to shop around. Then, see for yourself the difference renting a MI-BOX self storage unit will make. Get better service and better prices with MI-BOX Self Storage in Freehold, NJ.